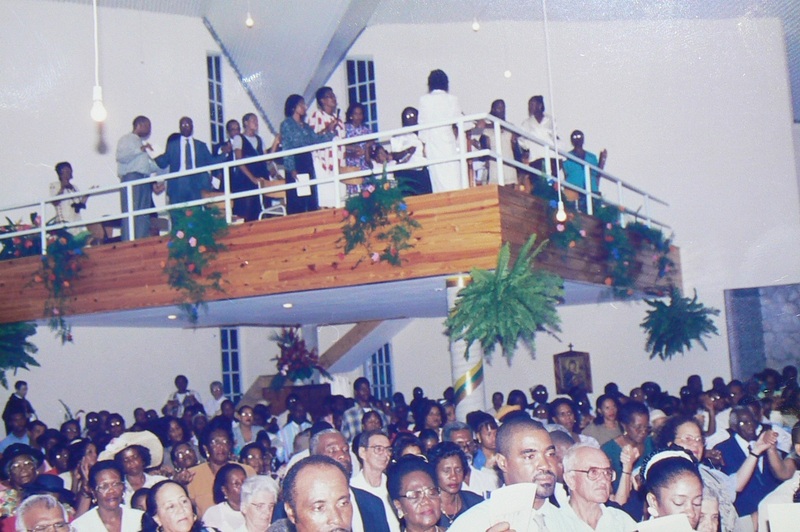 July 4th 1972 was a festive day in Calibishie, as their brand new church hall or multipurpose building was official opened by Bishop Arnold Boghaert. A large crowd gathered, “including truckloads of visitors from as far as Soufriere and Giraudel”, according to the Dominica Chronicle. The building was adored with a mural done by Lennox Honychurch, based on a design of Gilda Thibaud Nassief, with the theme “casting the net” which was an appropriate image for a chapel dedicated to St. Peter. Frs. Henri Brennan FMI, parish priest and Jean- Baptiste Villeneuve FMI, the builder, concelebrated with the Bishop. This building sustained damage with each passage of a hurricane , in 1979, in 1980 and in 1995. 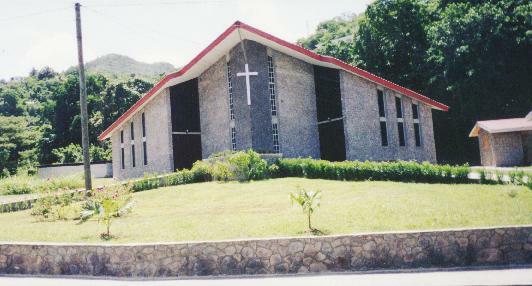 Even as repairs were done after the damage the building kept deteriorating: the steel structure, exposed to a lot of seablast lost its structural integrity; concrete foundations were cracking; the roof developed more and more leaks; a branch of a breadfruit tree fell onto the roof; the chapel flooded several times. As a result Bishop Gabriel Malzaire, in consultation with the parish priest at the time, Fr. Celsus Auguiste, decided that a new chapel building was needed. Fundraising for this new chapel was in full swing when Hurricane Dean hit on the morning of August 17, 2007 and lifted & rolled up the roofing. The parishioners had no choice but to look for an alternative place to worship: first at the government school building and later, when that building was also declared unsafe for the public, a local restaurant. On August 24, 2010 I presented my design for the new chapel to Fr. Celsus Auguiste and his Calibishie Chapel Reconstruction Committee and it was accepted. 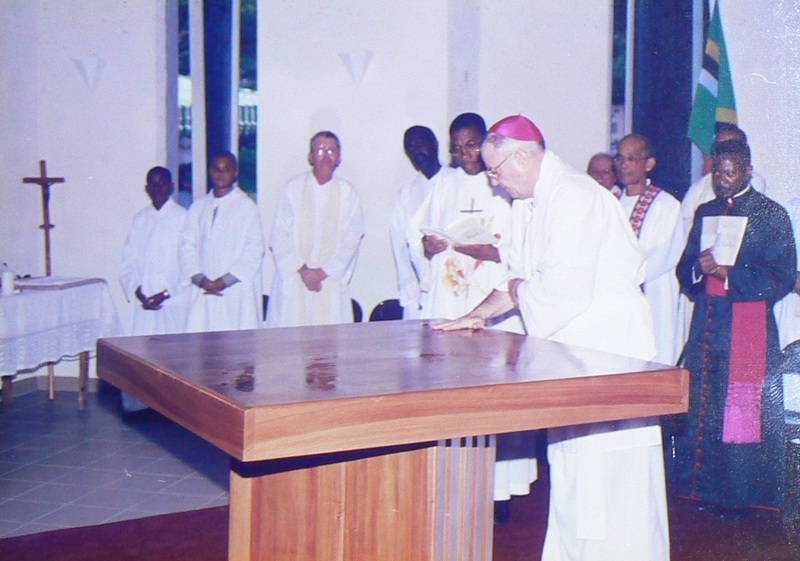 On September 26, 2010 Bishop Gabriel Malzaire performed a ground bearing ceremony with a large crowd in attendance. I had the opportunity to explain the design and its liturgical symbolism. Sadly Fr. Celsus could not attend this important event as his mother died a few hours earlier. The technical drawings were approved by the Physical Planning Division on November 17, 2010. Requests for tenders went out, but as the available funds were insufficient, only a section of the building could be started. The construction of the foundations and the erection of the galvanised steel frame were started in August, 2012. Once that was done, the works could only continue as funds were limited: the concrete floor was cast with volunteers between January 11-12, 2013; the concrete blocks were installed with self help in April 2013. It was slow going but the catholic community, under the leadership of Fr. Conan Shillingford and a hardworking building committee, was determined to finish their chapel. Finally all their efforts were rewarded when they moved into an unfinished chapel, still under construction, late 2013. The building at that time had no windows nor doors. The Divine Mercy and patron Saints images and angel murals were installed in 2014. The works and fundraising continued and finally, the chapel was ready for the official blessing on July 2, 2017. Bishop Gabriel Malzaire in the presence of Fr. C. Sebastian Robert MSFS, parish administrator Deacon Alvin Knight and a large gathering solemnly dedicated the new chapel to Sts. Peter and Paul. Sadly Fr. Conan could not attend this moment he had work so hard for, as he was on sick leave. What remains to be done is the construction of a tall bell tower, with toilet facilities and a vestry under neath. see other articles on this chapel in this blog (below). 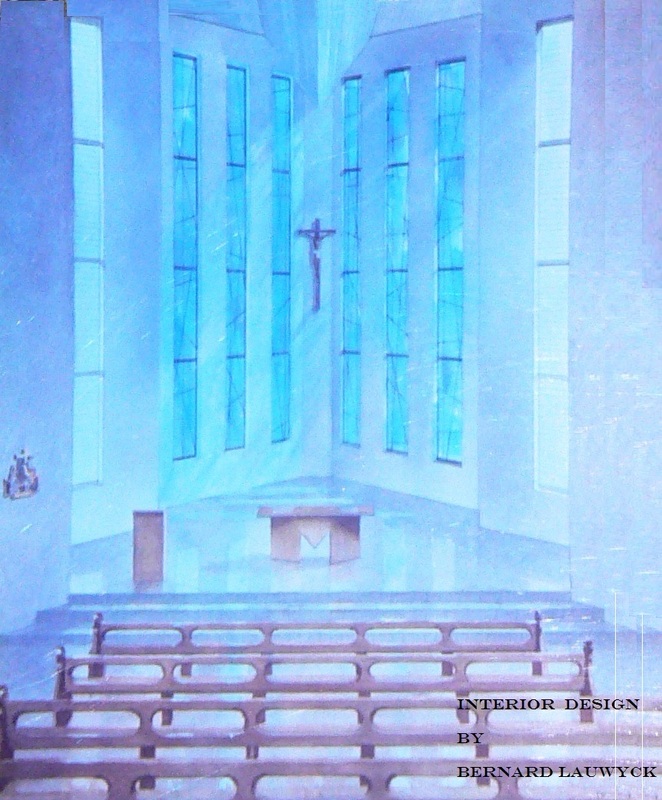 This entry was posted in buildings in progress, CALIBISHIE CHAPEL, design by Bernard Lauwyck, modern chapel in Dominica;, modern church in Dominica, stained glass and tagged CALIBISHIE chapel, catholic chapel in Dominica, Sts Peter and Paul chapel on September 23, 2017 by Bernard Lauwyck. The chapel in Calibishie was dedicated and solemnly blessed on July 2, 2017 by Bishop Gabriel Malzaire . Its patrons are Sts Peter and Paul. This new place of worship replaces the previous building which was severely damaged by Hurricane Dean in 2007. 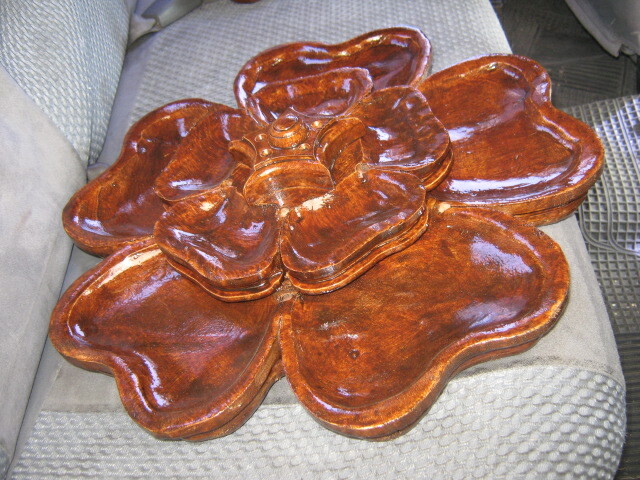 The sanctuary furniture was donated by the Joseph family from Calibishie through the initiative of Mr. Simeon Joseph. Countless people and several organisations made contributions to the construction of this chapel. This was a community project which was started by Fr. Celsus Auguiste, built when Fr. 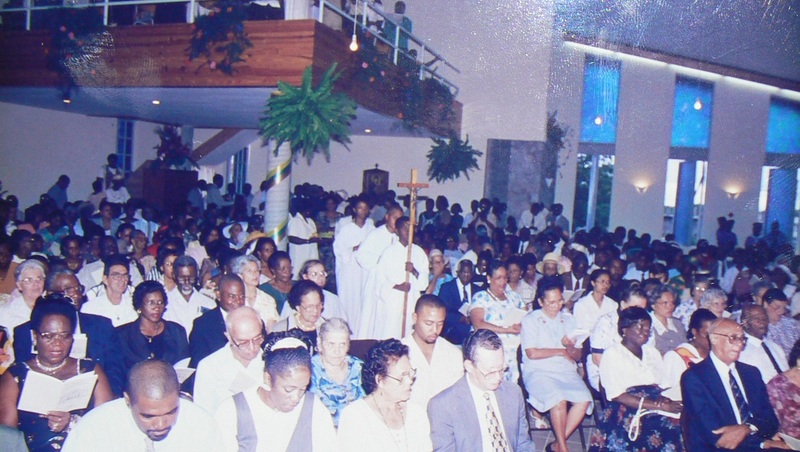 Conan Shillingford was parish priest and blessed during the administration of Deacan Alvin Knight. I personally spent countless hours at Calibishie , day and nighttime, to move this project forward. The Main contractor was Ronald Bedneau. A lot of work was done by local free labour, coud-de-main. We need to commend the parishioners of Our Lady of La Soie and especially the ones at Calibishie for their untiring efforts and devotion. Coloured windows include representations of the patron saints Sts Paul and Peter and THE DIVINE MERCY of Christ. click on Calibishie chapel link on the right side (churches under construction) to find out more about the design and construction of this chapel. 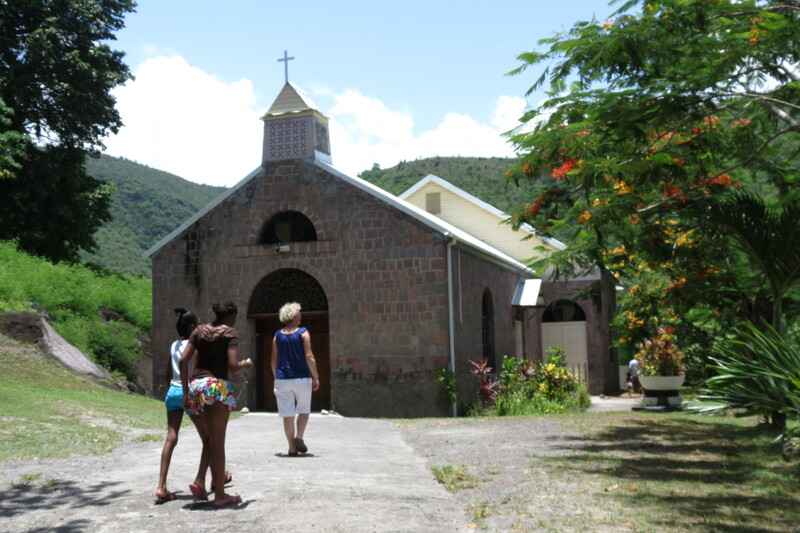 This entry was posted in buildings in progress, CALIBISHIE CHAPEL, design by Bernard Lauwyck, modern chapel in Dominica;, modern church in Dominica and tagged CALIBISHIE chapel, Sts Peter and Paul chapel on July 6, 2017 by Bernard Lauwyck. façade facing West with window depicting the DESCENDING DOVE, the two patron saints and the beautifully carved entrance doors in local mahogany timber ( donated by Jacqueline Douglas). This entry was posted in design by Bernard Lauwyck, modern church in Dominica, NEW PORTSMOUTH CHURCH, PORTSMOUTH CHURCH, stained glass and tagged catholic, churches, Dominica, Holy, Place of Worship, Portsmouth church in Dominica, stained glass on June 14, 2017 by Bernard Lauwyck. The manufacturer is doing an excellent job with the window frames . Soon all 32 windows will be completed and installed. This entry was posted in design by Bernard Lauwyck, PORTSMOUTH CHURCH and tagged Portsmouth church, Portsmouth church in Dominica on April 18, 2017 by Bernard Lauwyck. I have not been able to write up the history on the Canefield church, but I will certainly do this. 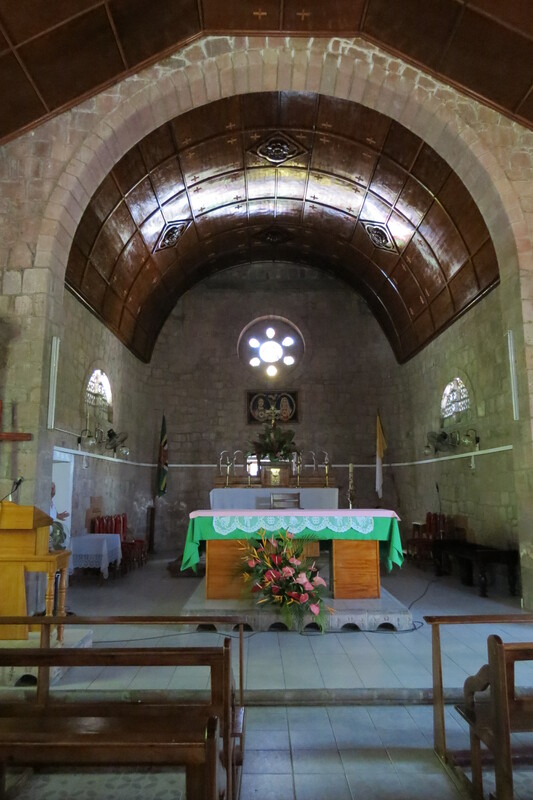 Dominica contains all types of churches from Romanesque to Neo-Gothic to modern styles. 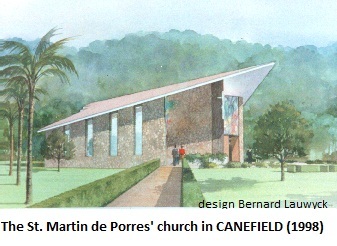 This entry was posted in CANEFIELD church, design by Bernard Lauwyck, modern church in Dominica, NEW CHAPELS or CHURCHES and tagged Canefield church, catholic chapel in Dominica, churches, modern church in Dominica, St. Martin de Porres on February 6, 2017 by Bernard Lauwyck. 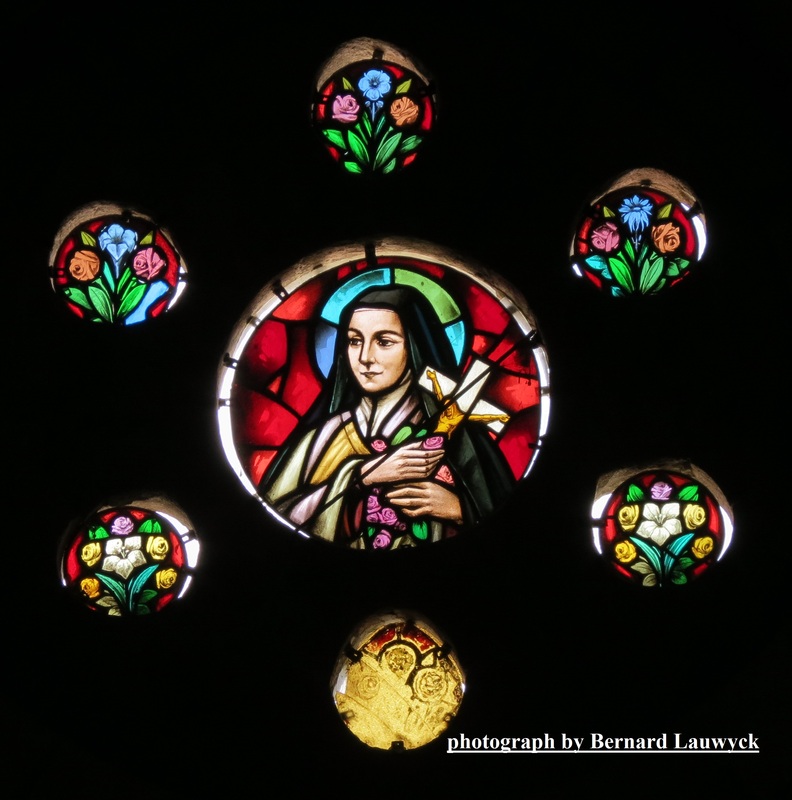 This church was solemnly blessed and dedicated to St.Theresa of Lisieux in 1929. It is a beautiful building, constructed in local quarried porous red-colored stone with a timber roof structure, covered with corrugated galvanized steel sheets. In the words of the late Bishop James Moris in his history of the Diocese of Roseau : “The church was constructed with splendid materials, graceful proportions and exquisite beauty” The building is one of the few cross-shaped (cruciform) churches in the Diocese of Roseau. The original windows of the 1930’s church had to be replaced by Monsignor Eustace Thomas with durable aluminium windows in 1990. Monsignor also set the new roofing project in motion. Fundraising continued under Rev. Fr. Elveau and the new roof was installed under Fr. Paul in 2006. The Parish installed ceramic tiles shortly after the roof was completed. At that time, there was no resident priest. When the newly ordained priest Fr. 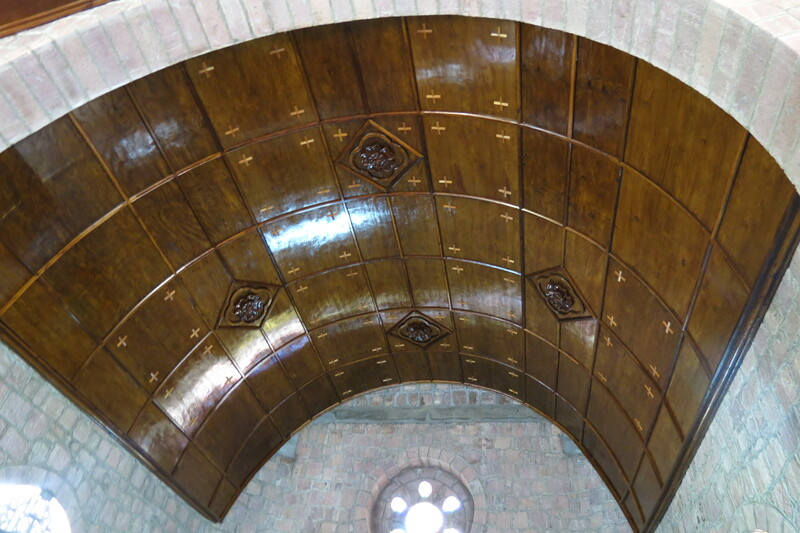 Nigel Karam was appointed Parish Priest of St. Theresa, he identified a ceiling as the most pressing need. It was impossible to have ceremonies in the church, during heavy rains as the sound of the raindrops on the galvanised roof was deafening. Fr. Nigel Karam brought me a photograph of the type of ceiling he wanted and my team started the design. 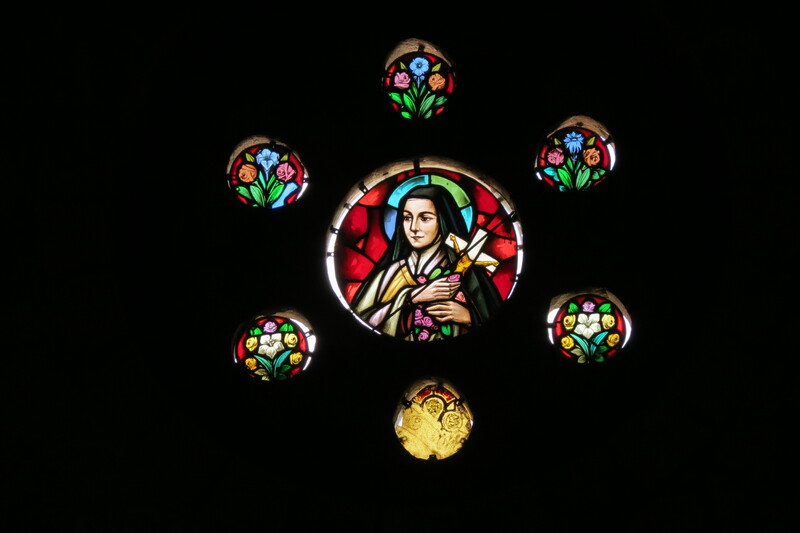 as St. Theresa is referred as “the little flower”. 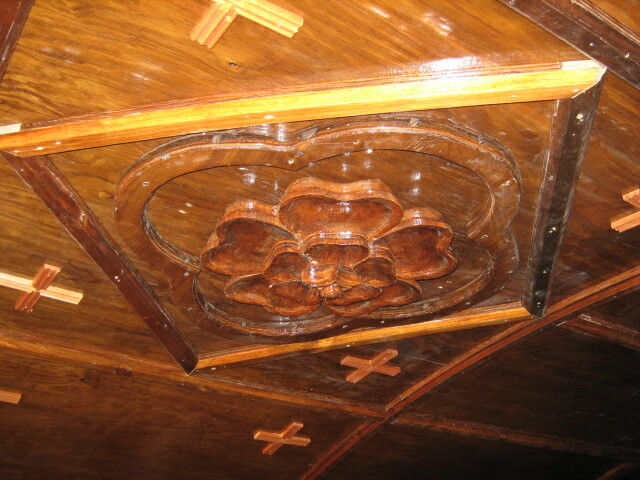 After funding and materials were secured , the first part of the ceiling was completed in 2010, as you can see below. The nave was completed in June 2012. This entry was posted in design by Bernard Lauwyck, OLD CHURCHES and CHAPELS, ST. Therese church in Salisbury, Sunday Mass at 7 am on October 18, 2016 by Bernard Lauwyck.